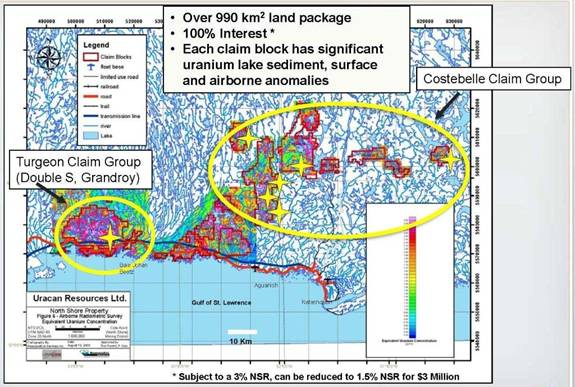 Uracan Resources' initial drill program at a new zone has returned uranium grades that are two to four times of their compliant 40 million pound inferred resource at its North Shore Property in Quebec. Grades of 480 ppm (0.048% or 0.96 lbs/t) U3O8 at their Costebelle property caused a flurry of trading in the stock - TSXV:URC . Costebelle is about 65 km northeast of Uracan's 40 million pound Double S deposit, which is 154.9 million tonnes with an average grade of 0.012% U3O8. Uracan has a market cap of $25 million. Even an overall Costebelle grade of 300 ppm would make it 50% higher grade than the Valencia Deposit of Forsys Metals (TSX:FSY $320 million market cap) and Bannerman Resources' (TSX:BAN $80 million market cap) Etango Deposit. Both these deposits are in Africa. Quebec has been named the top mining jurisdiction in the world two of the last three years by The Fraser Institute, an independent think tank. At the long term price of US$58 per pound, this equates to a theoretical rock value per tonne of $55.68 for an open pit operation - very economic. Uracan said the mineralization at Costebelle is open to depth and along strike. Management sees a 1500 m potential strike length in this one area. This zone at Costebelle - called A4 - is one of five zones that Uracan wants to test. 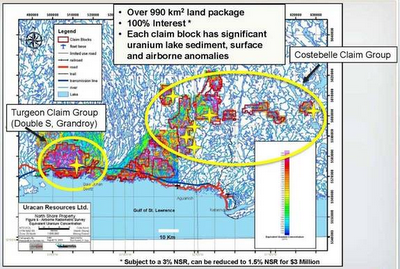 They believe the large Costebelle area - almost all of which has never been explored for uranium before - has significant size potential for an economic uranium deposit. The summer drilling program will be announced after all assays from the 20 hole winter program.